Summer officially has a few weeks left, technically speaking, for for sports geeks near and far, the fall arrives with the start of football season, and the end of baseball season. While the major leagues have months left in their season, the Spokane Indians are in the midst of their final homestand, with games tonight and Thursday against Everett to cap off a season in which the team full of prospective Rangers scuffled at times, playing basically .500 ball while developing skills that will lead the vast majority of the team to other squads in the Texas Rangers farm system in 2016. 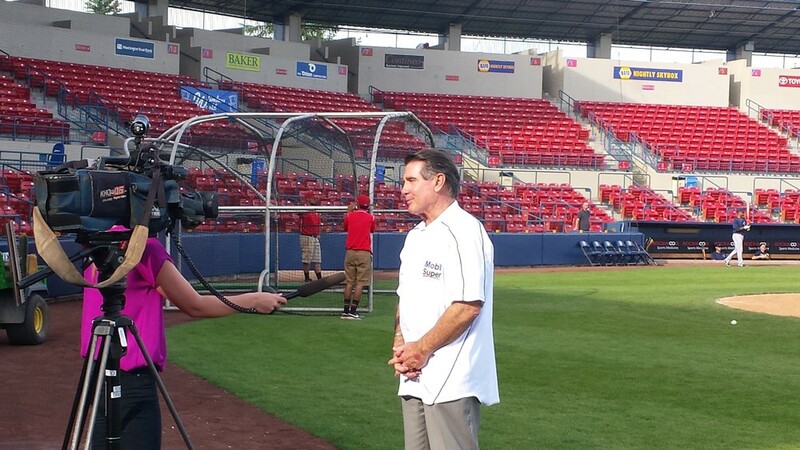 Steve Garvey, one of the team's all-time legends dropped by Tuesday night to throw out the first pitch before the Everett series opener, pausing beforehand to chat with local media types about his role on the legendary 1970 Spokane team that won the Pacific Coast League championship. It was a team loaded with future major league players — it was, after all a AAA team at the time — including Doyle Alexander, Charlie Hough, Bill Buckner, manager Tommy Lasorda, Bobby Valentine, Davey Lopes and Garvey, who arguably had the best major-league career of them all. He was the 1974 National League MVP, a 10-time All-Star and a World Series champ before he was through. The affable Garvey went on to some fame hosting events like ski races (hilariously skewered by the Cheap Seats guys) and currently runs a communication company when he's not traveling around acting as an ambassador for the national pastime. He called Spokane "part of my history," and that 1970 team "arguably the best in minor-league history" in an interview with The Inlander. Garvey got famous for his excellent defensive play at first base when he hit the majors, but in Spokane, he was still a third basemen with a wild arm that he had injured playing football at Michigan State. He attributed the 1970 team's success to the fact many of the guys on the team had moved up through the Dodgers minor-league system together, giving them some continuity in their roles, if not the towns they were living in. Dodgers manager Walter Alston gave him a chance to play first base and pinch hit, and Garvey took advantage with a couple of knocks in his first major-league game, and "that was the beginning of my career, really." "I tell the guys now, it's takes a good four or five years to really get it" and stick in the major leagues, Garvey said. He called himself part of a wave of first basemen, along with the likes of Pete Rose and Chris Chambliss, who weren't all 6'4" and swatting home runs, instead turning the position into a place for great defensive players and athletes who could also hit to all fields. "I used to feel just as good digging a ball out of the dirt with the bases loaded than getting a two-run double," Garvey said. The kids now are bigger, stronger and faster than in his day, Garvey acknowledges, "but do they play the game as fundamentally sound?" Anyone who watches baseball regularly knows the answer to that. This was Garvey's second consecutive year throwing out a first pitch for the Spokane Indians, and it sounds like he'll always welcome the opportunity to return. And he has a strong strategy as an older gentlemen throwing out that first pitch: "Arc. Arc is the key. You don't want to bounce it. You'd rather hit the screen." Believe it or not, college football season is already off and running. The Montana Grizzlies, one of EWU's rivals in the Big Sky, knocked off the No. 1 team in the nation and four-time defending national champion North Dakota State in a thrilling opener on Saturday. Watch for the Inlander's football preview in this week's issue arriving Thursday, with a look at all the area teams. The University of Idaho opens their season Thursday night in Moscow (and our own Mike Bookey will be there), and Eastern battles former QB Vernon Adams, Jr., and Oregon in Eugene on Saturday. Washington State plays Portland State Saturday in Pullman.